Drink and soothe this winter away. This combo of Chesty Rub and Kids Tea will bring a new sense of calm to the household. We are super proud of our Chesty Rub. No nasties, no petroleum, no turpentine, no sulphates, no parabens, no mineral oil, the list goes on. Made with organic ingredients! Our Kids Tea is completely delicious and sweet and the perfect way to start the day or as a warm down drink at night. Made with the highest quality organic herbal blend available. Our beautiful herbs are the highest quality and sourced from certified organic farms. Both these products contain wild crafted murunga (kakadu plum), a traditional aboriginal food which contains the highest source of Vitamin C in any fruit in the world. Warm oil rubbing on fingertips and gently apply to chest, back and feet. Organic ingredients of: coconut oil, beeswax, lanolin, castor oil, lavender oil, lanolin alcohol, menthol, eucalyptus oil, carnauba wax, vitamin E, cedarwood oil, nutmeg oil, wild crafted murunga (kakadu plum), bach flower remedies: white chestnut, clematis, cherry plum, rock rose, love & hugs. Perfect pack to start off our day, a juice tea as known by my kids with a dash of honey freshly brought from our Pre school and a rub of chesty balm on back n chest, and than cuddles from my kids smelling those beautiful aromas knowing I ain’t using nasty chemicals on them anymore! Just opened the tea it smells sooo good- cant wait until school pickup to give my kids a cup! I feel do much better having the chesty rub just knowing im not putting harmful chemicals on their bodies anymore-ive thrown out the other rubs and this will be our go to! My daughter loved this from the moment I put it on her, and must say i didn’t mind it on myself either. Love the chesty rub product! Rub a little on the soles of their feet at night, and it really helps to stop them waking from coughing in the night. This is such a great combination to boost cold resistance or bring relief to an unwell little one! The tea is tasty and sweet, and the chesty rub smells lovely! 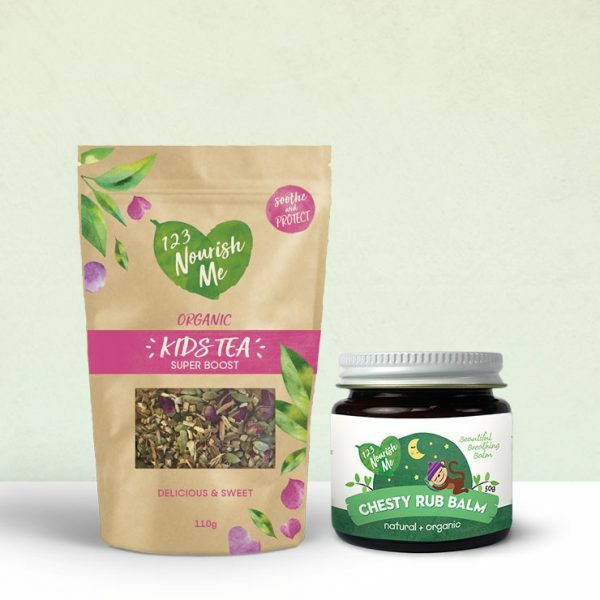 The best product for your kids…since i discovered this product my kids had never been sick…chesty rub is organic and safe .love it and has been recommending to dear and near because its awesome!! Love the Chesty Rub for all the family. Little one’s sleep right through even when they have a cough. A must have in our kit along with Sleepy Head Balm. Great products, thank you all. This stuff is magic! We haven’t had ongoing coughs or congestion since finding it. It smells amazing and is a really nice texture. I like that the kids can rub some on themselves without me having to be worried about all of the chemicals. My 2.5 year old loves this! We only rubbed it on his feet and it opened up his airways to allow him to get a good sleep during a cold. Smells divine! Our daughter has suffered with an aggressive cough due to medical reasons and this has been a recent purchase to help alleviate the symptoms. We’ve used it for about a week and it has definitely reduced the amount she coughs at night time which is amazing! A fantastic product, absolutely love the smell and actually works!! I love this product so much! Really great for congestion and colds and smells AMAZING! What a fabulous product. It smells divine, applies easily and has helped me sleep soundly over the past few nights despite congestion and a tickle in my throat before I went to bed. I will be buying this again when I get low, although as a little goes a long way, I shouldn’t need to for a while. Thanks for a ‘clean’ product to help me stay healthy. Only been using the chest rub for a week. Both my children had a horrible chest cough and couldn’t breathe properly. The first night l used it I could hear the kids breathing easier and the cough wasn’t as constant as it had been. A few days in they were breathing better and feeling happier. Not just effective for the kids! I had a little dry, irritating cough recently and immediately after I applied some chesty rub on myself, the cough settled down and I was able to relax enough to fall asleep. Even my husband has used with immediate benefits! Goes without saying that the kids also get amazing results! I remember HATING the smell and feel of Vicks as a child, but this smells just divine and my girls love it when I put it on them. The pot is smaller than I was expecting but a little goes a long way so it should last ages. Beautiful product. The texture is lovely and the smell is as well. I absolutely love this product. It has truely been a life saver for my son with his colds. The smell is lovely and I love that is has no nastys. I highly recommend this product!! A must for all mums and dads this winter for their kids! Absolutely delicious smelling! Brought it for my one and two year old to help with congestion but I loved the smell so much, I smear it all over me too! The texture is so buttery, not drying at all! A new favourite! Love love love the chesty rub! My bub was getting a chesty cough after having a runny nose for a few days and after using it overnight the day it arrived bub started to improve. That morning bub was so much happier! Hi, I love this chest rub. I used it on my daughter to help with her cold and she got such a great night sleep. Love the smell. Love the silky texture and beautiful smell of this product. Thank you for a fabulous, pure product for our children! Smells amazing and so much better than chemical laden alternatives! This chest rub is amazing on so many levels! Feels & smells divine plus it actually clears the nose. Perfect for winter snuffly noses! The chesty rub smells divine! Helps soothe my boys and give them a good nights sleep. This balm has a big thumbs up from me and my children. Thank you so much for creating something that has no nasties, smells AMAZING and can help to fight the bad bugs at the same time. I will definitely by this again! 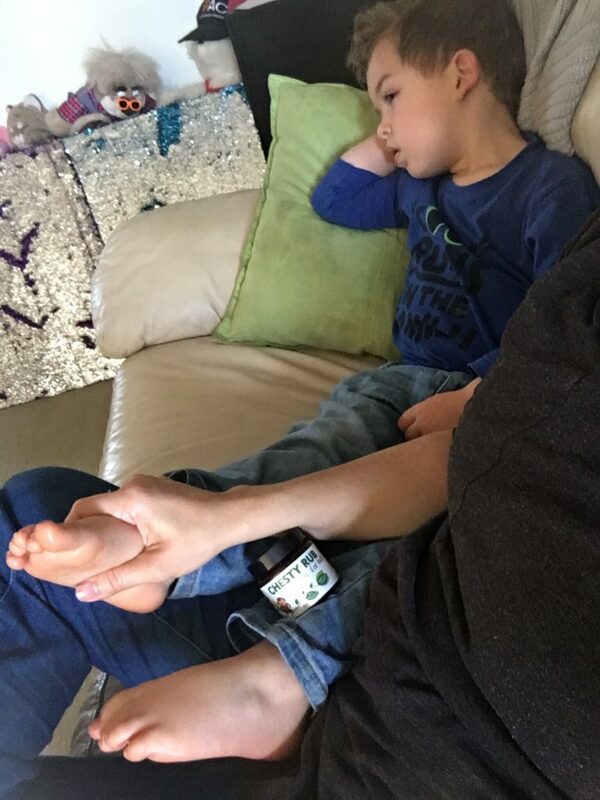 We use the chesty balm on my boy when not well, on the weekend he got a bee sting, the hand began to get very red, I rushed him inside washed his hand after removing the stinger and I applied some chesty rub on it! It was magic! The redness and pain Was gone with in mins!!! So not just a fantastic product when he has the flu, which by the ways works brilliantly but there is other amazing uses for it. I recently ordered chesty rub in preparation for winter and not only two days after it arrived, my 2 year old developed a cold! We started using it straight away and rubbed it on her chest and soles of her feet at night. Her sniffles were gone by the end of the next day. The smell is lovey, and I feel happy that this product is not harmful for her at all. So nice to have something I can confidently put on my 1year old while he’s a little blocked up. I am always looking for a more natural option and this is great! Every product we have tried from 123 nourish me has been AMAZING! Sunscreen, wonderarms ,sleepy balm and chesty rub all exceeded our expectations. Thank you for creating such awesomeness. A natural product that works!! Can’t ask for much more than that – one very happy Mum here!! A lovely alternative to Vicks, with a great smell that is not as strong. I wear it myself! Absolutely love this balm and love the piece of mind rubbing chemical free, safe products on my little one! Works like a dream and smells even better!! Love love love this product. It smells amazing and I find it actually works better than the chemically derived brands! (Which I will NEVER use again since finding this product). My all time go to when my little ones are congested or have a cough. It always helps to settle down the symptoms and let them rest easier. Highly recommend! Love this product. We use it on our toddler. We were recently away & my mum started to get a sore throat & sneezy & felt like she was getting a cold. I gave her the chesty rub to try & she was fine the next morning. She was very impressed as are we every time we use your products. First of all, this smells amazing! My boys have been fairly lucky when it comes to colds, but both had sniffles and coughs this year. I put some of the chesty rub on and not only did they smell great, I truly believe it helped them go down for the night and breathe easier. Helped my 2 girls overnight with their coughing. I don’t think I was putting enough on to begin with however I think I have it down pat now. Nice smell, not too strong. Love this natural alternative. Goodbye forever to the synthetic stuff! Will most definitely be a repeat customer. Happy children, happy Mummy! I absolutely love love love this product! It has been a game changer this winter season with my eldest daughter in prep and so many bugs going around her class. I will be stocking up for sure before next winter. Cannot recommend this product highly enough. My kids have had been sick since last season. Wanted to try a non toxic and gentle rub to ease their coughs and blocked noses at night. Kids are asthmatic and have allergies and chest rub doesn’t irritate their skin or ‘burn’ like big brands. Chesty rub smells delicious! I feel so much happier putting it on my girls than the other products out there. My eldest even asks to apply it herself! Beautiful product! We received this product by accident due to a processing error but are so impressed with how gentle yet effective it is! We love the beautiful aroma which has helped clear up a long standing cough and runny nose in my little one. It’s gentle and feels beautiful on my daughters skin. Plus I know it’s all natural so my mind is at ease. I can not reccomend this product enough. We will be ordering this product again and again! We absolutely love the Chesty Rub!!! Great product…I love being able to use natural products on my grand babies that work.. This stuff smells amazing and I have been rubbing it on my 2 year old and 6 year olds chest of a night and morning because they have a nasty cough and snotty nose and I swear it helps clear them up! Love it! Definitely be buying again!! Absolutely LOVE the Chesty Rub!! After Being sick with the flu for nearly 2 weeks and spending over half of each night awake coughing, I ordered the Chesty Rub which arrived within only a few days of ordering. I started using it the night I received it and was able to sleep without any coughing!! Best of all only a very small amount was needed to get such an excellent result (although I did have to explain this to my nearly 5 year old after he covered the whole top of his feet, half way up his legs and his chest with it)!! He now asks for it to be put on everyday he’s at school which I totally LOVE! Thank you for such an amazing product that I can’t recommend highly enough!! Thank you!!!! I purchased the ‘Calm kids box’ and I’m delighted! The Chesty rub has helped my daughter sooooo much during her cold/virus, Along with the sleepy head balm we were both able to get a good nights sleep, the smell is so pleasant my daughter loves them (me too ofcourse) I’m loving the magical wash too! This Chesty Rub is just brilliant! It doesn’t irritate sensitive skin, helps blocked noses breathe and feels good! I 100% recommend it! My sons are autistic and it’s a fight to use the usual store bought vapour rubs, they react to the heat & the smell. Have just tried this on our youngest and he let us rub it on him without complaint and has not reacted to any smell (which smells awesome by the way). Super happy, can’t wait to try some of the other products you have available! We purchased the Chesty Rub not knowing what to expect in honesty as we had such bad experiences with shop brought chest rubs, they flared our 3 sons excema and their asthma up, we decided to try the Chesty Rub after reading it had no chemicals in it and what an absolutely amazing product it has been. With 3 sick boys and hubby it has helped them breathe better at night , it eases the coughing within 10 minutes and as a mother it feel so good knowing its all natural oils that im putting on my families skin. Our only regret is not finding this product sooner , thank you so much! Both my girls (4 & 2) have been fighting colds and coughing for months. Within minutes of using chesty rub coughing eases and after a couple of days, their cough is nearly nonexistent! So very happy the girls are finally getting some uninterrupted sleep and regaining their energy. My Mr 2 years loves some special mummy pampering as he recovers from croup. He loves relaxing on the couch for a chilled out foot rub! Thank you for your beautiful products both my son and I are thoroughly loving them! today’s toddler pamper session includes ‘chesty rub’ …. yay for natural products you can trust! Excellent chesty rub- the only natural one I’ve found that I actually am happy to use on my kids. Beautiful smooth texture, not too oily, gorgeous fragrance that actually helps clear snuffles but also soothing at the same time. Only one I’ll buy now! Such a great product and chemical free. I love the smell and it’s not just for kids, I used it on myself and it was wonderful to finally get a goodnight sleep and ease my blocked nose and head cold. This isn’t just for kids!! My husband has come down sick and was coughing a lot last night so I made him put on the chesty rub!! It stopped him coughing all night and we all managed to get some sleep!! Thanks again Alisa. Makes me so happy to have a product in my medicine stash that I know is safe for us all, and actually works! I love this product – so nice to have a natural chest rub that is free from toxins in the cupboard. It smells divine and is so calming and soothing. Thank you! Amazing product. Used it on my 14 month old when she had a cold and was struggling to breathe and in minutes she was asleep and so much more comfortable. Thank you! Used this for the first time this morning when my son woke at 2am coughing and congested! Rubbed on his chest, back and feet. He fell straight back to sleep and not a single cough to disturb his sleep and woke at 8am! Thank you so much! This is brilliant and will remain a staple in our household!! This product came in sooo handy last week, in a short few days he is all better. Our son also inhales it out of the container. He gets a bit carried away sometimes and ends up with his nose in it! LOVE having something I can rub on the kids… & me… when they are unwell and knowing that it isn’t filled with nasty ingredients. Love the smell and love the texture of all your balms. AMAZING, highly recommend. I love this product. Anytime my children have a cold and/or cough they ask too have this rubbed on their chests and feet. It helps so much to relive their symptoms especially their coughs. It also smells amazing!! I have used this a couple of times so far and not only does it smell amazing but it has done wonders for my daughter whenever she has a cough. It’s so reassuring to know that I’m not putting any toxic chemicals onto my daughter’s skin that could potentially be absorbed into her little body. Thank you for a great product! It is so nice to be able to use a natural non toxic rub and actually enjoy smelling this rub knowing it’s healing us! (& not putting who knows what into our skin) It’s not over powering which the kids love! We have a range of ages and we all love our chest rub! This is a fantastic product (my equal fav of all the ones I have tried so far). I love how comforting the smell of this is without the overpowering smell you can get with some of the commercial products. I feel confident using this on my girls. And it works! My Miss 2.5 suffers from the sniffles and coughs quite regularly (hello day care germs!) but this has helped so much. Really like this rub. I’m a convert for sure. Have been looking for a Vicks alternative. A LITTLE pricey though, so I’ll be using it sparingly. I have had a long run of my children getting sick and yes yet another one today. I have put this lovely Rub on my sons chest for a good night sleep. He was coughing earlier and I had put a bit on his throat and his cough didn’t come back. He loved the minty smell….Love it so far….and loving all the goodness in your products. I already feel like a better mum. “Time for a rant”………. Im just sick of depending on the chemist shelves items that are meant to be helping us but slowly poising us and our kids. Thank you, you clever little chookies, good stuff…. Your products are in my house for good. Hooray!!!! !